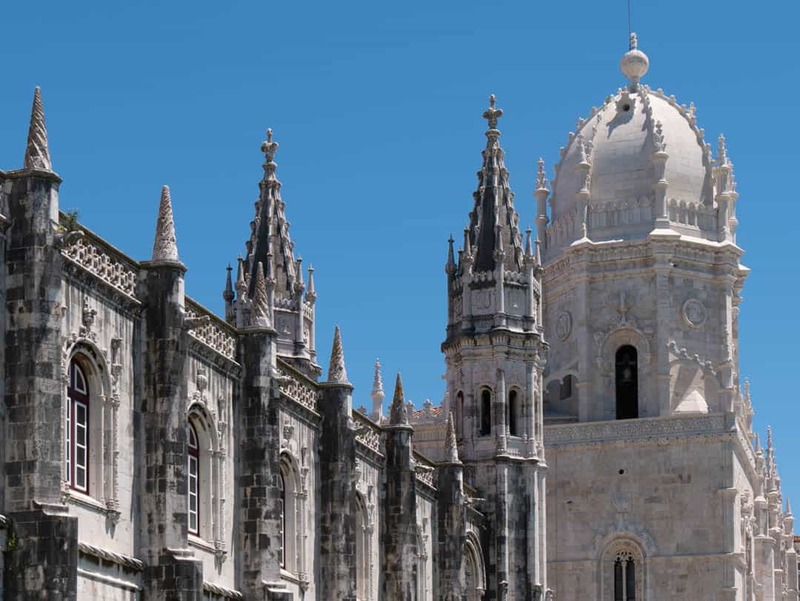 First and foremost, people usually come to Belem, a district of Lisbon, for one thing. The original makers of the Pasteis de Belem would be utterly amazed at the icon these simple pastry treats have become today. In 1834, all clergy were expelled from their convents and monasteries throughout Portugal, following a revolution. In nearby Jerónimos Monastery, an entrepreneurial person started making and selling pastries from within the walls of an adjoining shop, simply as a means of survival. Now, the Pasteis de Belem are made using the same recipe that was developed in 1834, and commercialised by way of a small factory in 1837. The owners, descendants of the original owners still work in the business today. Word has it that because of the secret nature of the recipe, they don’t ever travel on the same aircraft together. Now that’s a dedication to preserving an age-old tradition. Did they live up to the hype? Things that become iconic, whatever their origins have a rod made for their back. Being able to perpetually and consistently live up to the expectation can be daunting. Social media has exacerbated it all too of course. As we arrive via the tram from the centre of Lisbon, the first thing I see is the enormous queue of people lining up along the footpath. I suspect more than half of them are just here because Trip Advisor names it as the number one thing to do in Belem. They’ve come here to eat one, take a selfie and leave as quickly as they arrived. Well, not so quickly given this queue. We are here as part of our mission to uncover the best Pasteis de Nata, so it is of vital importance that we get to spend some serious time here. But first, that queue. It’s not the first time we have experienced a queue in Portugal and it won’t even be the only one we see today. As people who will look for any way to appropriately avoid queuing, here’s the best tip we can give you. The queue is actually for Takeaway Pasteis de Belem. Inside the ornately decorated building, staff work feverishly behind the counter. The cashier takes your order and your money and then other people fulfil it. It’s bedlam in here! Push your way gently through the crowd and into another door, about midway along the building, and you’ll find yourself in clean air. Inside there are over 400 seats at the tables, where you can enjoy a more leisurely approach to your Pasteis de Belem experience. Before anyone says, “but it will cost you more to sit down”, I can completely dispel that theory as well. Sitting inside allows you to watch the sideshow, for it is just as busy inside, and the waiters have mastered incredible plate handling skills. It’s worth the ticket price alone! One after another, plates of the house pastries come out on the arm of a waiter accompanied by tea and coffee. There’s a menu available here, with sandwiches and salads but this is one place where menus are not really required. When we can finally halt one of the whizzing waiters in their tracks, Stirling makes the order quickly and succinctly. “Six Pasteis de Belem please, a cappuccino and a hot chocolate”, he says. We’d stepped it up a notch it appeared, progressing from one each to a six-pack. “It’s cheaper for six”, he said with a smile. I think I’d been conned since a quick perusal of the menu indicated there were no economies of scale provided for multiple purchases. The Pasteis de Belem were good, but for our overall assessment of them, you’ll have to stay tuned for my review of all the Pasteis de Nata we ate. A short walk from Pasteis de Belem is the most magnificent building in Lisbon. 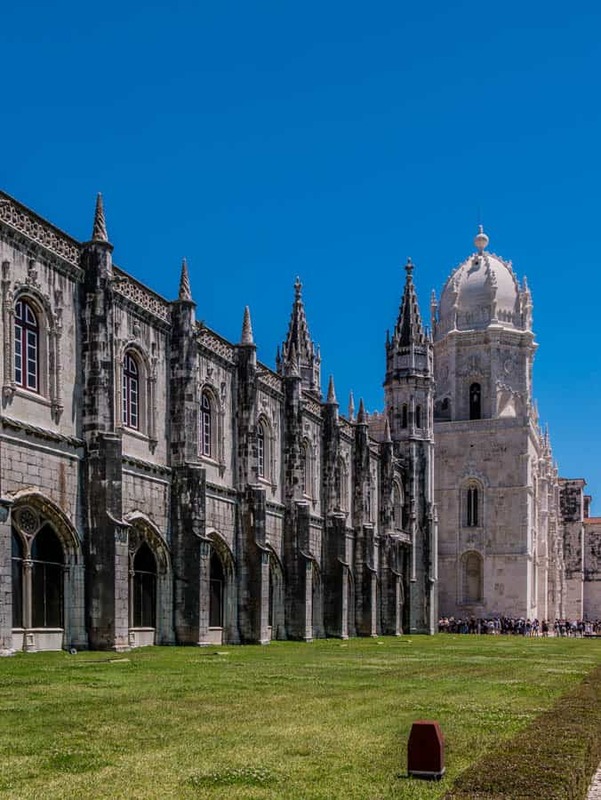 The Jerónimos Monastery, a sprawling Gothic cathedral, highlights the wealth of the Portuguese empire in the past. The 14th century saw the beginning of prosperous times in Portugal. Built on the River Tagus, the town of Belem became an important player in maritime activities. Fisherman and seamen filled the town, and the local church was the site of their last-minute prayers, before they returned to the sea, a life of some considerable risk. One of the seamen, was Vasco de Gama, a name now synonymous with exploration, opened up the route to India and in doing so, brought many riches back to Portugal. For the next 100 years after de Gama’s return, construction was undertaken on this monastery and was eventually handed over by the King to the monks. Hundreds of years later, after surviving the 1775 earthquake and the effects of neglect, the monastery has once again been restored. It now exists as a protected UNESCO site, containing the tombs of the royal family and fittingly, Vasco de Gama. This is another location where the queue is enormous. As you approach the monastery, the queue will become immediately evident. There’s no protection from the sun here either until you get inside the monastery. To the left of the main entrance is the National Museum of Archaeology. This is where tickets may now be purchased via five automatic ticket machines inside the entrance. If you love art, make your next stop the Berado Collection Museum, a modern looking building built from sandstone blocks. Inside there are temporary and permanent exhibitions of contemporary art. Note – there is a major railway line on the main road in front of the waterfront that cannot be crossed except for official pedestrian bridges. Following are the details for access to the Belem Tower, the next place to visit on your walking tour of Belem. From the Berado Collections Museum, you have two options to get to the Belem Tower. You can keep walking down the Praca do Imperio, the main road, away from the monastery and turn left at the intersection of Largo Princesa and the Avenue Torre de Belem. This will take you through the back streets, a distance of approximately 800 metres. From there, you will need to turn left on the main road and walk across the pedestrian bridge to the other side. The tower is just through the park. Alternatively, exit via the rear of the Berado, onto Ave da India, and walk along the main road. It’s a similar distance, but you have the water and marinas as a backdrop. Cross at the pedestrian bridge to get into the park and access to the Belem Tower. A recurring theme here, more queues and more standing in the hot sun. Built in the early 1500s on the Tagus River, the Belem Tower, was an important part of the military’s defence strategies. A UNESCO protected structure, visitors can climb to the top for a view. To me, the tower is more spectacular from an architectural perspective than form a viewing one, so we made the decision not to queue, and to check it out from all angles on the exterior. There’s still plenty left to see and do in Belem, and it all happens around the waterfront. The Belem Lighthouse, made from red brick, was never officially used as a working lighthouse. Further along, the Monument of the Discoveries, a huge stone and concrete structure rises into the air, with the Vasco de Gama Bridge in the background. The monument, with numerous people, carved out along the side, represent the key figures in Portuguese history, and the important role it has played in world events. For me, Belem is all about the waterfront. It’s a new area, slowly being revived and with this comes a thriving scene of restaurants and cafes. With a paved promenade built along the water, it’s a continual hive of activity. Cycles, runners, walkers, skateboarders and even scooters share this area, wide enough for everyone to be able to move freely without fear of a collision. For a drink, try the Bar 38°41′, a bar attached to the Altis Belem Hotel. It’s open-air and has some great cocktails on their list. It’s become quite the place to be to have a drink and watch the sun set. Our spot for lunch was initially decided on because it was housed in a shipping container. 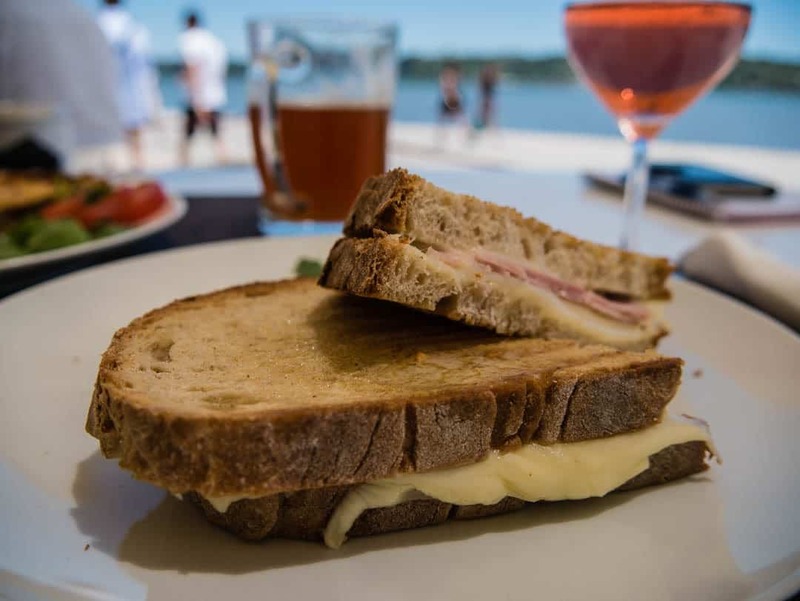 A rectangular, white box with sizeable river frontage, À Margem is the perfect spot for a drink or a casual lunch. There are tables inside, or as was our preference, one outside closer to the promenade. Now, remember, we’d already devoured six Pasteis de Belem, so lunch was always going to be a more moderate affair. Paired with a crisp glass of Portuguese rosé, I chose a simple ham and cheese toastie from the reasonably straightforward menu consisting largely of salads and sandwiches. Whenever we see wild boar on a menu, we usually fight over who is going to have it. It’s so yummy, but a protein that we just don’t get to see very often. Stirling jumped on that straight away with a wild boar pie and salad, paired with a non-carbonated pale ale. It was sensational. Where to stay in Belem? If you want to stay on the waterfront, the Altis Belem Hotel is the best pick. Check out the reviews on Trip Advisor. Closer to the monastery, you’ll find Jeronimos 8. Click here to go to Trip Advisor. The Palacio do Governador is right by the Belem Tower. It is a palatial hotel built on the site of the former Governor’s house, hence the name. check reviews and pricing on Trip Advisor. Alternatively, staying in Lisbon is the more common option, where there are many hotels to choose from and only a short tram ride away. The easiest way to get from Lisbon central to Belem is by bus or tram. Buses 727, 28, 729, 714 and 751 offer services to Belem. We caught the number 15 tram which originates in Praça da Figueira. The main commercial square, Praça do Comércio is also a stop. We caught it at the Cais do Sodré train station which was in the neighbourhood where we were staying. Tickets can be purchased on the tram at the ticket machine. Alternatively, a daily travel card covers all trips on the Lisbon public transport and will be a better economic decision if you plan on catching it a lot in one day.